Indulge your nails with two luxurious and nourishing nail treatments. Includes one Prestige Top Coat and one Prestige Base Coat, enriched with Jojoba oil and Argan oil for a superior, super fast-drying, glossy shine. 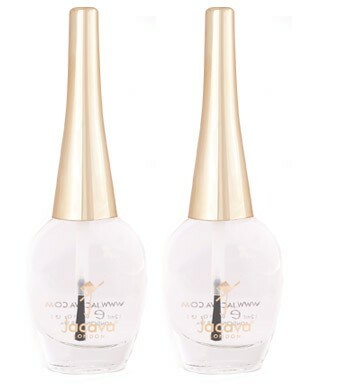 The extra-nourishing formula of all JACAVA London nail polish helps your nails grow longer and stay stronger. Chip-resistant and super fast-drying in quick speed time. Alternatively, you can purchase the base coat or top coat separately. Luxury Prestige Base Coat and Prestige Top Coat duo, which are part of our nail treatments range.